They have been bitten, hospitalised and one even lost a finger, but the risks of the job notwithstanding snake rescuers working with the forest department or privately are always ready to respond to distress calls. Starting early March, with the onset of summer, the distress calls go up. As opposed to common belief, snakes also thrive in urban settings, says Priyanka Kadam, founder of Snakebite Healing & Education Society (SHE) and member of the WHO’s Snakebite Envenoming Working Group. Besides, according to her, this is the time (summer) when snakes procreate. “Snakes are solitary creatures. When female snakes release ‘pheromones’, the male snake oblivious to its environment and only concentrating on the scent can be spotted in the urban setting, in houses, crossing the road, among others,” she says. Moreover, with mounds of garbage, in cities and towns, snakes get a continuous supply of prey like rats, frogs and lizards. And with fewer natural predators like owls, eagles, mongoose, civet cats and peacocks, spotting snakes in cities is not uncommon. RAWW alone captures 800-1,000 reptiles every year from Mumbai’s eastern suburbs, Thane, Palghar. 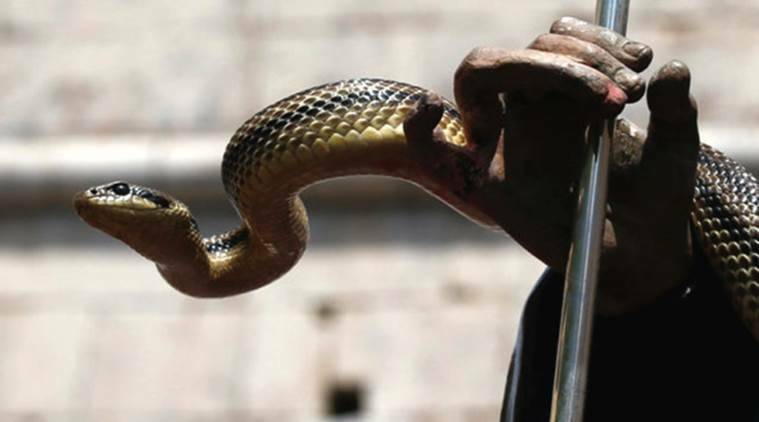 According to the WHO, some 50,000 people die of snakebites annually in India; however, the WHO fears this estimate may be just 10 per cent of the actual figures. In 2017-18, 1.96 lakh cases of snakebites were recorded, with West Bengal, Maharashtra and Tamil Nadu leading the statistics. Kadam said it is disheartening that snakebite envenoming doesn’t interest too many people. “Snakebite is a reality. However, no medical school teaches snakebite management, only forensics is taught,” she says. Featuring snakebite victims (both dead and alive) and their families from across the country, SHE released a 23-minute documentary in 2018. After years of follow-up by various advocacy groups, SOPs, guidelines for capture and release of snakes were only formed two years back by the forest department. In June 2018, the Maharashtra government approved the setting up of a National Venom Research Centre and asked the Centre to aid the public sector Haffkine Institute in its work on snake species and poisons.